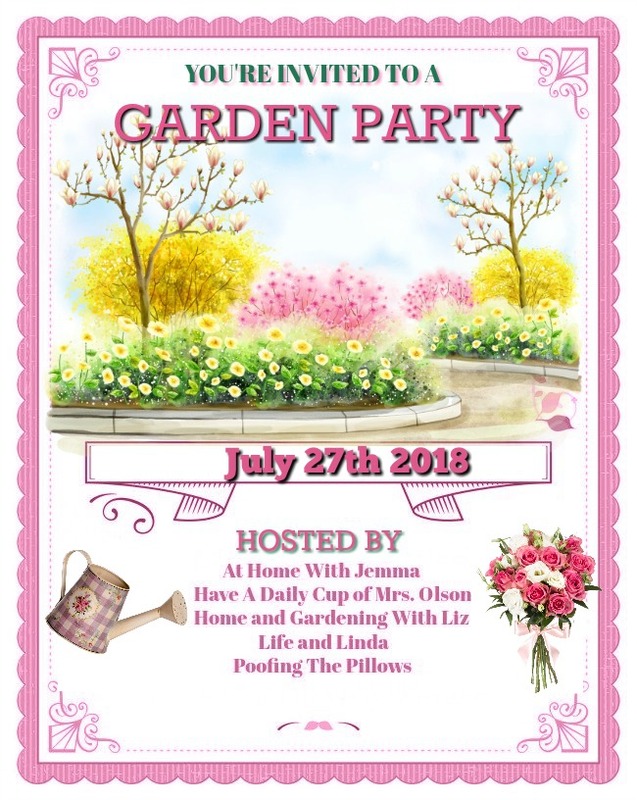 hosted by 5 gardening friends. Do you like to use different objects for garden art? I do...and this is one of my favorites- an old 1930's wagon. 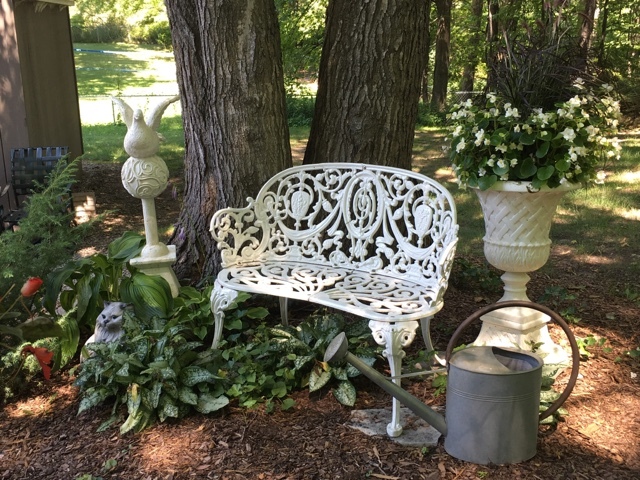 An antique garden bench with some garden art objects. This is a basket bicycle frame (somewhere under there) white Wave Petunias and Brocade Wilhelm Langguth geraniums. I recently relocated it from the garage area. The little bunny was from my daughter's home that she sold and now he's hanging out with me! This obelisk has been used for many plants as well as gazing balls a long time ago. 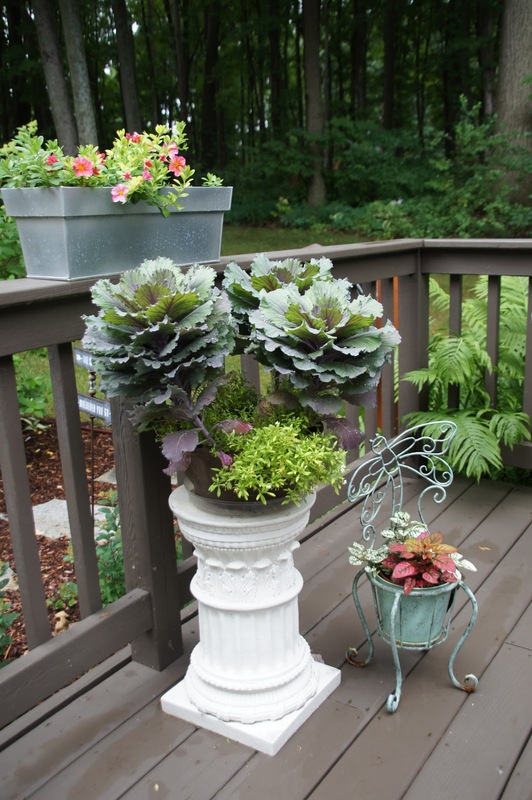 A sweet little butterfly stand planter and a pedestal to elevate plants. 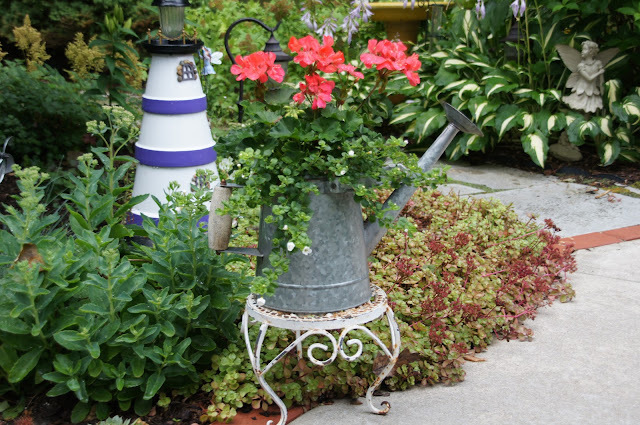 A chippy white rusty stand displaying a watering can full of Flamingo Rose geraniums and white bacopa (which is about to rebloom). My claypot lighthouse was a fun project you can read about if you'd like to "here". You can see a Fairy in the distance standing among some hostas! Another Fairy peacefully content under the giant hosta. I found this adorable miniature red wagon at Pier 1 which is actually a photo clip frame holder but I saw it differently! I had Dan put a few holes in it so it can drain. 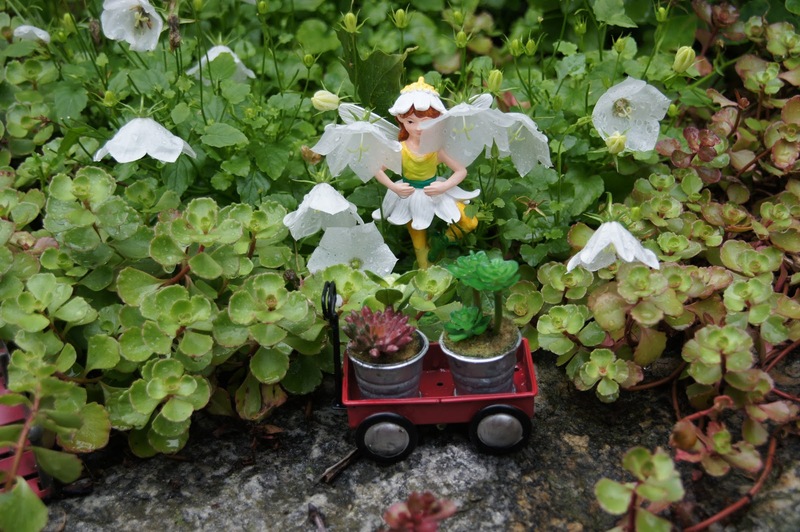 My little fairy Irish dancer is prancing about the White Chips Campanula- Bellflower plant. Thank you for joining us for our July Garden Party! Thank you Stacey. Little by little these things come across our path and we enjoy adding them! 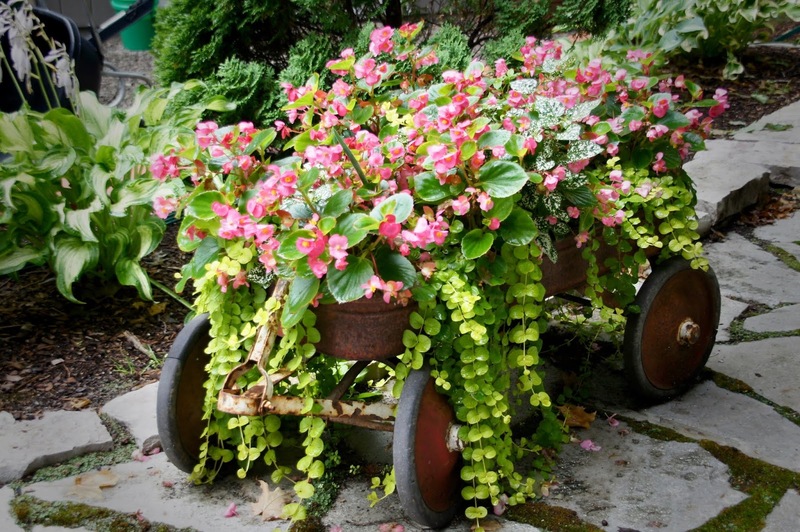 What a delightful way to use quaint old things in your garden, Liz! it's a paradise of pretty blooms! Thank you Marty- I wish we all lived closer so we could visit each other’s gardens! Your gardens look so beautiful with your added garden art. Loving the cute fairies and the little wagon is adorable. The decorative bench is such a nice find and adds elegance. I love garden art done tastefully. You have a great eye and a green thumb Liz. 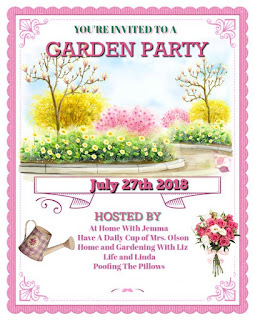 A pleasure to join you as a fellow host for this month’s garden party. Thanks Linda- it’s fun to share all of our gardens isn’t it! Love your wagon Liz. That is awesome. I love to put old things like that out in my garden area too. Thank you Kris- here and there I have some vintage items! Your fairies and the wagon both make me smile extra big! Your garden is simply amazing!! Has it ever been featured in a magazine?? If not, it should be!!! Thanks so much for hosting this lovely garden party!! Thank you Debbie- the closest I came to a feature was in a local newspaper’s quarterly magazine story focused on fairy gardens a few years ago. Your wagon is simply adorable, Liz, and looks so pretty filled with begonias and is it, creeping Jenny? I love all your treasures around your garden, and especially the fairies! Thanks for hosting! Thank you Kitty. Yes that is Creeping Jenny and also some polka dot plants. Your garden and garden art are so lovely. It's too hot right now to garden here, but I can't wait for the weather to cool off next month. 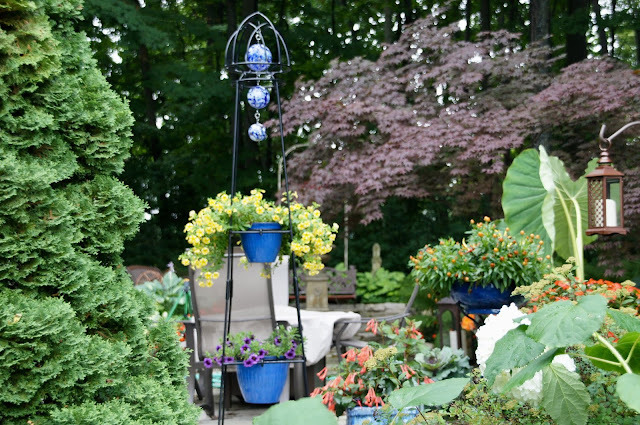 Fall is planting time and I'm looking forward to adding a few more plants. You are such an artist when it comes to gardening and such an inspiration! Oh thank you Pam that’s quite a compliment! I hope it cools off enough to allow you to get outside more. That sounds great Margy- thank you for stopping by! Your garden art and planters are wonderful and I think add so much to the garden. I have to be careful to not put to many in my garden and look like a flea market! Thank you Ann Marie. Yes too much can ruin it! 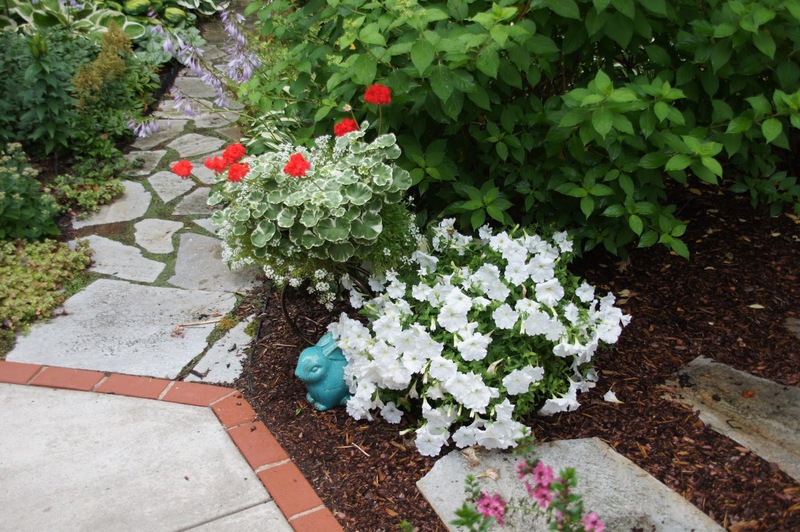 Your gardens are just gorgeous Liz and they tell a story now too with your darling, creative and vintage finds!